People who regularly travel on an underground transport system like London's tube might consider a tour of such a system to be a pointless and slightly torturous way of spending a sunny Saturday afternoon. That's probably because they're never encountered a metro system like Moscow's, which, compared to the Underground, is utterly fantastic. 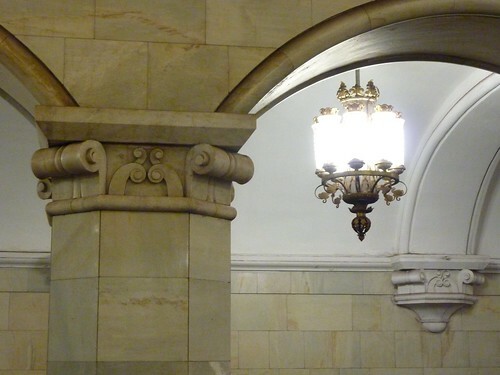 Plans for the Moscow Metro date back to pre-WWI times but that war, the subsequent revolution, and the Russian Civil War that followed threw a wrench into those plans meaning construction didn't start until the 1930s. However when they did start, the first lines were built at a breakneck pace and in a style of such sumptuous beauty that the stations themselves are like art galleries through which trains happen to roll every few minutes. 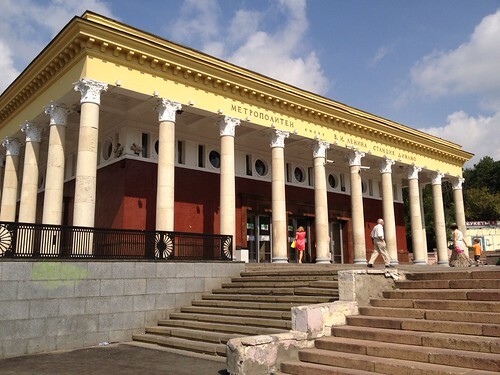 Mayakovskaya Station, a UNESCO World Heritage site. 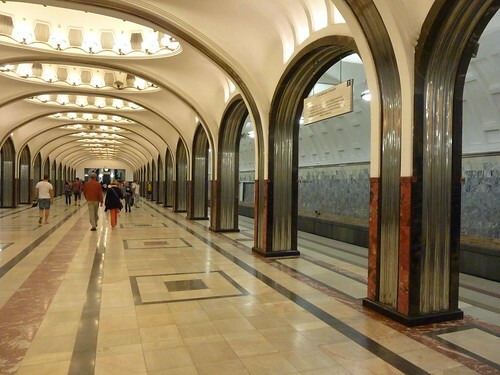 The construction of the Metro during the early Soviet era was seen as a way of proving the superiority of the Soviet system, especially in the 1930s, when the Great Depression in the west had capitalism floundering. The all-encompassing power of the government meant that they could mobilise huge numbers of workers toward the completion of the project very quickly. Apparently when Stalin announced plans for the construction of the Metro thousands of loyal communists turned put to help dig the tunnels by hand with pick axes, shovels and hand carts to remove debris. They included up to 10,000 member of the Soviet youth league (the Moscow Komsomol, now commemorated at Komsomolskaya Station). The resulting stations - above and below ground - really are fantastic. Almost all the walls and floors are covered in marble or granite, even in the long winding tunnels that connect different platforms underground. And the ceilings too are adorned with coffers or mosaics or chandeliers, or sometimes all three. My local station, Dynamo, which looks like a Parthenon knock-off plonked down alongside a 12-lane highway. And it is by no means atypical. I elected to take a guided tour because I was hoping for a few worthwhile tidbits of trivia to include here. I had some luck with Moscow Free Tours who did the Red Square tour I took not long after arriving so I elected to take one of the not-free tours that complement their daily "free-but-tips-encouraged" offering (which is obviously a loss-leader for the rest of their schedule). I joined a 950 rouble (!) 90 minute tour starting from a station close the the Kremlin. I and a group of 7 other internationals were guided by the annoyingly perky and elfin Irina and the much calmer Pavel, through a large number of stations. Sadly, Irina used one of those portable headset microphones attached to a small speaker she wore around her neck which had the effect of distorting her bubbly commentary into the loud-and-unintelligible range while simultaneously irritating the normal Muscovite commuters around us. It was a bit cringey. I tried to stick with Pavel, who was quieter, more interesting, and spoke really excellent English. Nonetheless, it was a worthwhile few hours. 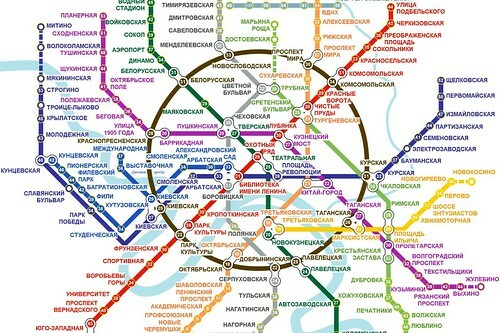 Irina was happy to repeat the oft-quoted-probably-completely-apocryphal story about the brown "circle line" that links the mostly radial system. The legend says that Metro planners were showing Stalin a map of the system and the leader put his coffee cup down on it, creating a brown ring centred on the page. Too afraid to question the man about his intentions, the engineers simply went ahead and built the circle line, reasoning it to be the safer choice. And a good thing they did, because it's quite handy. Riding the Moscow Metro is generally a pleasure. Perhaps that's because I mostly do so outside rush hour when the trains aren't terribly crowded. Still there are undeniable advantages to the Moscow system over others I've used. First, it's really cheap. A single ride is 28 roubles, which is about 50p or 75 cents (compared to the minimum cost of a ride on the Tube which is currently about £2.10 for the shortest journeys). And that 28 roubles lets you ride anywhere in the system for as long as you want; there are no fare zones, no sliding scale of costs, and none of that peak/off peak malarky, just one price. It's brilliant. Also, the trains come very frequently. In busy times they arrive less than a minute apart, but even late at night you'd be hard-pressed to wait more than about two minutes. The average time between trains in 90 seconds. And each platform has a digital clock at the end showing the time elapsed since the last train departed, so you can get a pretty good idea of how long you can expect to wait. 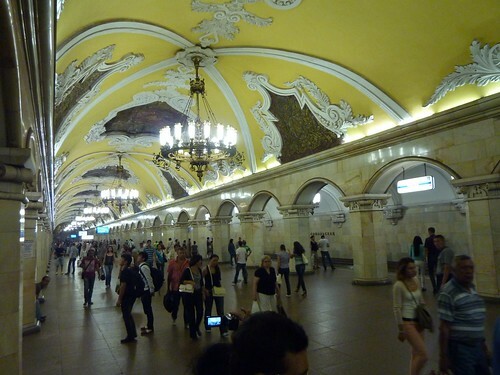 My guided tour took us through many of the Metro's most fantastic stations. We visited the aforementioned Komsomolskaya Station, where the ceiling is adorned with mosaic of famous military struggles from Russian history, including two that have been retouched several times. 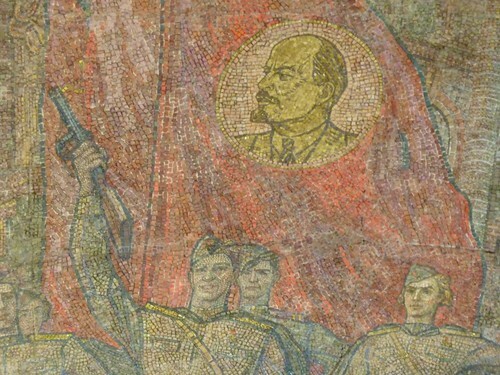 The battles depicted range from the 13th century to the 20th, and two of the 20th century offerings have been retouched, some several times, to erase images of Stalin and replace them with those of Lenin. 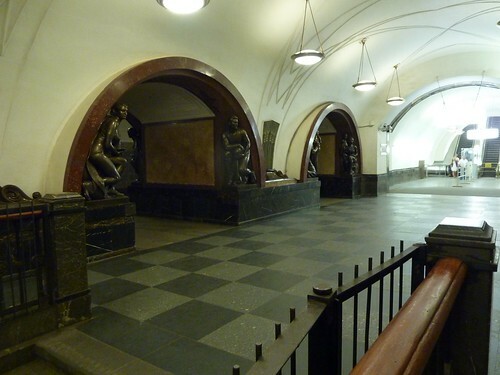 The most famous station may well be Ploshchad Revolyutsii (Revolution Square), which is basically an underground sculpture gallery. Like most stations, there's a long hallway that separates the platforms and is punctuated by archways that lead onto the two opposing platforms. Each of the archways is adorned with a pair of bronze statues depicting sturdy proletarians of all types - soldiers, mothers, students and sportsmen. The statues are also repeated along the train platform, 76 in total. 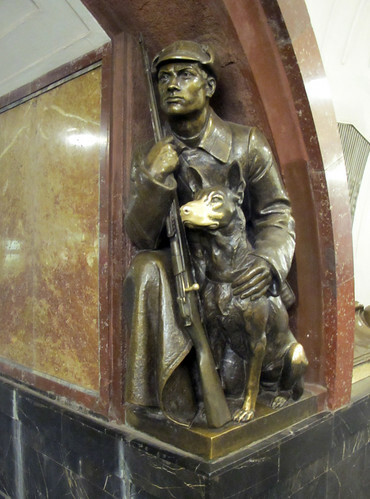 This one of a soldier and his dog is particularly popular. Rubbing the dog's nose is said to bring luck, and is a favourite spot for students getting ready for exams. 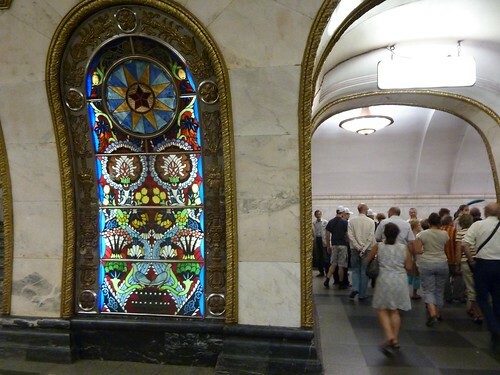 Novoslobodskaya is also well-known because its hall is lined with backlit stained glass panels. (Seriously? Stained glass in a metro station?!?) 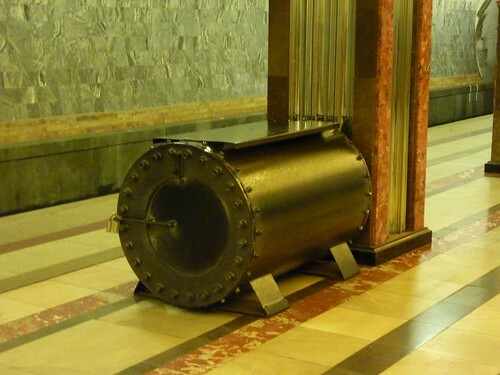 It's said that the Moscow Metro stations were intended to be "palaces for the people" and stations like Novoslobodskaya make that claim hard to dispute. I'm sure the cost was staggering, and I suppose it would be impossible to repeat in a different era, but it does make one contemplate how many opportunities there are to create beauty in public spaces, and how infrequently those opportunities are taken. 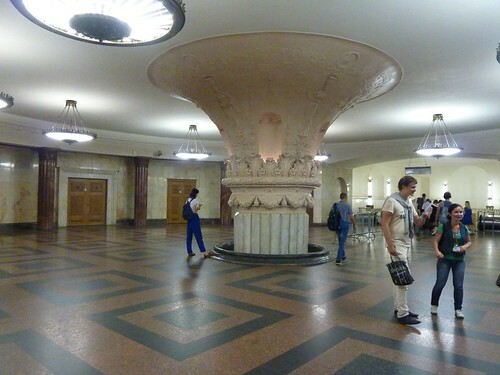 And what about this entrance hall at Kurskaya? 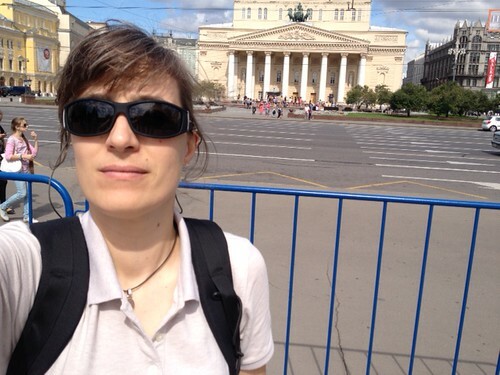 And here… back at Komsomolskaya. Again, this is typical. 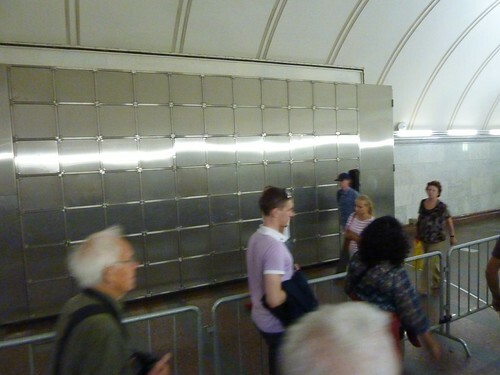 Dotted around the system, these are apparently big blast doors that conceal tunnels meant to be used as bomb shelters. And these appear in every station - they're bomb boxes. Used to contain suspicious packages that might be terrorist bombs. Eek. 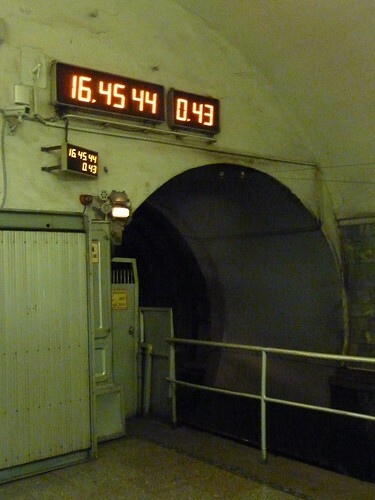 Like in London, underground stations were used as bomb shelters during WWII; the legend is that more than 150 babies were born in the Moscow Metro during that time. Also like in London, there are announcements made as each train enters and leaves the station. Sadly, the typically muffled/distorted nature of these announcements coupled with my extremely shaky Russian language skills mean that I struggle just to catch the name of the station, let alone the accompanying pleasantries. But Pavel let me in on my favourite bit of Moscow Metro trivia, relating to these announcements. Inside the circle line, voiceovers are in a male voice but outside the brown line the voice is female. And if you're traveling on the circle line you get one voice going clockwise and the other going counterclockwise! Fantastic. 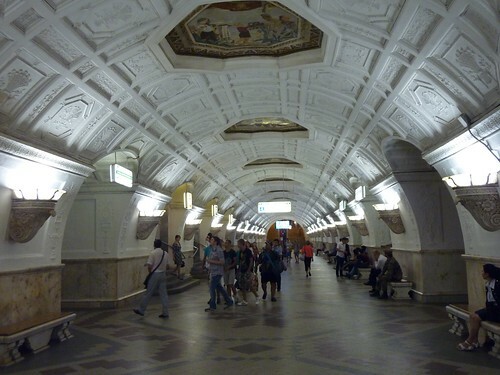 And so ends our brief trip into the Moscow Metro. As usual, there are more photos at Flickr. 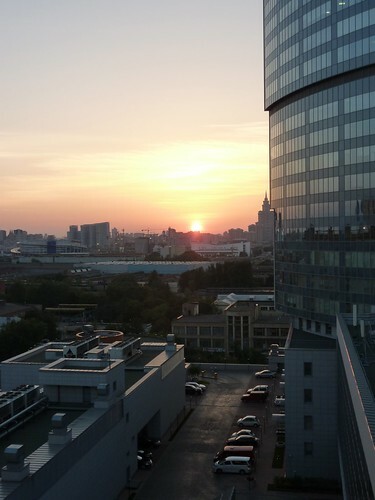 As for me, work is busy and frustrating, but nothing that I didn't expect. There are rumours I may get to move to a more central flat after all, but I've resolved not to stress about this one way or the other. And I've had some success with my Russian, though progress is slow. I should probably be studying a bit more (or at all...) but frankly I find that's the last thing I feel like doing in the small amount of spare time left to me. In the mean time, stay tuned, and I'll try to keep up with the blogging as long as the schedule allows. Until then, до свидания. I've been in Moscow for about ten days now but unlike when I started on the Ceremonies in London, we've dived straight into long days. And it turns out that working 8-10 hours a day really cuts into one's blogging time, so you're going to have to make do with a few random observations about life while I settle in some more and find the time and energy to do something more traditionally blogworthy. The original plan was that I'd move to a normal apartment after a short-ish stay at the hotel. Colleagues who've been here longer have been moved into apartments, but now, for whatever reason, there are general rumbles that no one will be leaving. It's our Russian Hotel California. There are pros and cons to this. Of course the hotel is luxurious and gorgeous. I've already mentioned the breakfast buffet every morning that's beyond extensive. Along with the usual fruit, cereals, pastry and hot options, there are always two large platters of smoked salmon. And a bowl of caviar. It's ridiculous. I've quickly had to impose some very strict rules about that, lest I end up having to be removed with a forklift. My room has an adjoining lounge that's got a kitchen, so if I want to cook something I can. There's also a small supermarket in an oddly fogotten mall attached to the hotel (which also has a mobile phone shop, furniture store, and, bizarrely, a pet store. So if I want to pick up a new puppy, I'm sorted.) And there's a well-equipped gym in the basement that's open 24 hours a day. Oh, and an Executive Lounge a couple of floors up where they do free drinks and hot hors d'oeuvres every evening. And of course someone comes and changes the sheets and towels and arranges the detritus on the bathroom counter in a regimented way every day. And there's a special shuttle bus that takes all the Ceremonies people to the office in the morning, and back to the hotel in the evening. In most every way, we want for nothing. I should probably just shut up right now, because uttering a word of complaint after reading back through those last paragraphs seems ungrateful in the extreme. But there are some drawbacks, mainly to do with location. (The real estate agents are right... Location, location, location.) The hotel sits on a a very busy street near an intersection with an even more major street (Leningradsky Prospekt, for anyone who knows where that is...). If you leave the bubble of the hotel/mall in search of, say, a nice cafe, or some shops to poke around in, or a park or bit of river to run past you're going to have to wander an awfully long way because it's a bit of a wasteland. Not exactly the ideal environment for a pleasant stroll. Of course it's not too long a walk to the Metro, which is cheap and fantastic and can whisk one away to any number of pleasant spots. But that just not the same, which makes a the place feel like a bit of a gilded cage. It's not the life I was expecting, but I really shouldn't complain. Except that I just did, so sue me. 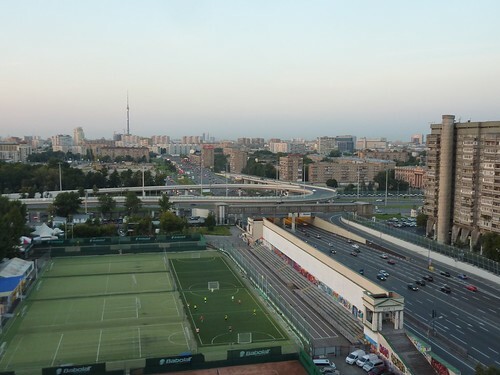 Everyone warned me that Moscow is an expensive place to live, and truly, they are not kidding. This is actually one of the other huge advantages of hotel life - having a roof over my head and a massive breakfast provided every day saves a ton of money. But buying groceries for lunch and dinner is still a shock every time. The first time I visited the grocery the day after I got here, I spent a long time wandering around trying to decipher the packaging and doing shocking calculations in my head: "Ten quid? For an utterly unremarkable block of cheese? What the hell?" 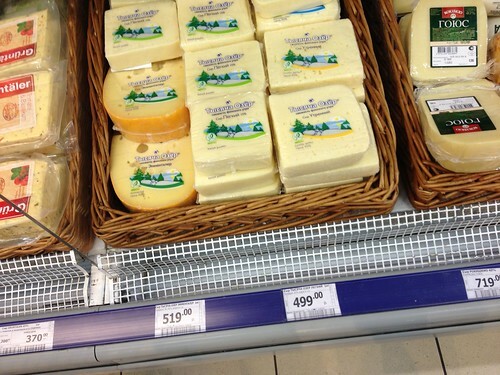 Cheese in the hotel supermarket. And that one on the far right? £14.50! Some things are not so expensive. For instance, Russian bread is cheap. I got a small round loaf of rye bread for about 40p. And fruits and veg aren't bad either. Still, I've been to the supermarket several times now and I've yet to get away without spending about £35 at a go, and still when I open the fridge the next day I think, "Meh, there's nothing to eat." I can't figure it out. Hashers about where Muscovites would go on such a quest and she directed me to a chain of stores called "Ашан" (Ah-shan) which, for ease (and comic effect) I have begun to think of as Walmartskaya. It was a fairly long metro ride to get there, and a longish walk on the other end, but it was so so worth it. After a week haunting the aisles of the small grocery at the hotel, Walmartskaya was heaven-sent. The main level was all household stuff, and they had tons of back-to-school displays and, well, all the kind of stuff you'd expect in a Walmart or Zeller's or whatever. And the prices were cheap! Coat hangers were 18 roubles each. That's about 35p or 55 cents. And I got my cheese grater and tea towels, and a few other necessities without breaking the bank. 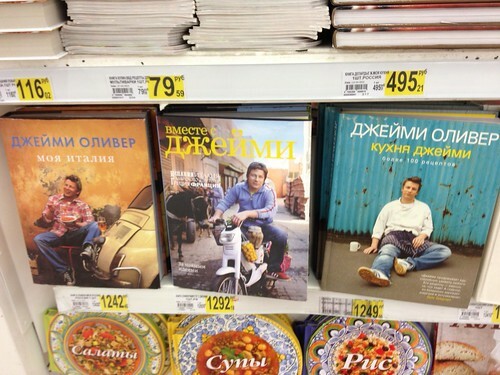 And of course there is a cookbook section. 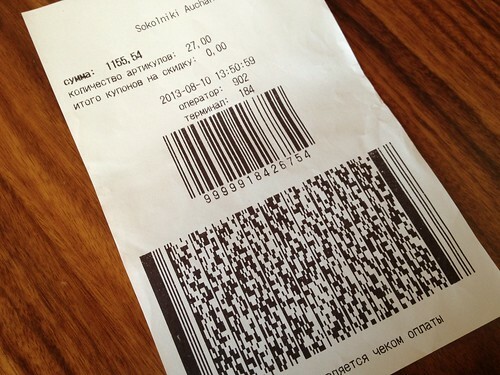 Then I had take that receipt about 10 feet to a bank of automatic machines sort of like automated tellers (cashpoints) where I scanned my receipt and inserted my roubles and got my change and a new, different bar coded receipt. Then in order to get out of the store I had to scan the second barcode at another scanner before the automatic gates would let me out. Interesting. As I mentioned, I've been running with the local Moscow chapter of the international "drinking club with a running problem". I've said it before, but it bears repeating... I love the Hash. I'd been in town for exactly four days before I found myself running through a farflung park in the outskirts of Moscow with a group of like-minded, friendly, crazy people who welcomed me into their group like I was family. It was a place I'd never have gone as a tourist, but with the Hash it was routine. Then on the following Friday I met up with them again for the aforementioned weekly Friday drinks. And I've just returned from my second Sunday run, in another lovely park. And I've been invited to a casual run on Wednesday and a dinner party next week. I bet I have colleagues in the office who've been here months longer than me but have no one to socialise with who's not also working on the Ceremonies, so I am pathetically grateful to the Hash for giving me a ready-made social group of people with local knowledge, common interests and, of course, beer. 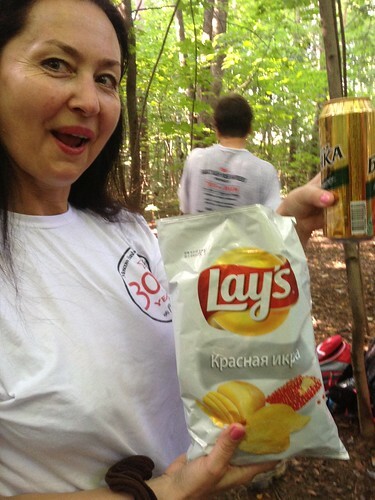 One of the local Russian hashers, showing off a Russian beer and a bag of Lay's caviar flavoured potato chips. And that's the report from Moscow this week. I'll try to get out and do something touristy and fun next week and give you a bit more local colour. 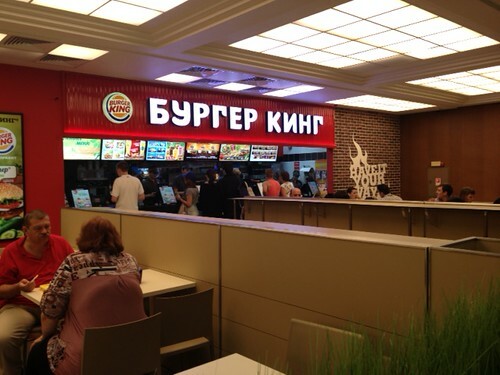 This will be a very quick post - I just wanted to let everyone know I've actually arrived in Moscow (finally!). I flew on Wednesday and was in the office Thursday morning. I'll try to get a more extensive post up next week, but I thought I deserved a bit of time to settle in first. In the mean time, things are fine. The hotel is gorgeous and has great facilities, like the extensive breakfast buffet where I've been making a concerted effort to eat my weight in smoked salmon every day. And the gym in the basement, which has really nice treadmills and a nordic style sauna and a Russian style banya (yay!). And my room has an adjoining sitting room and small kitchen. There's even a shuttle bus that takes everyone between the hotel and the office every day. It's a pretty sweet set-up, though I sense it could become a gilded cage. There's also a grocery store in a little mall in the basement where I've been attempting to stock up and roll out my very dodgey Russian. 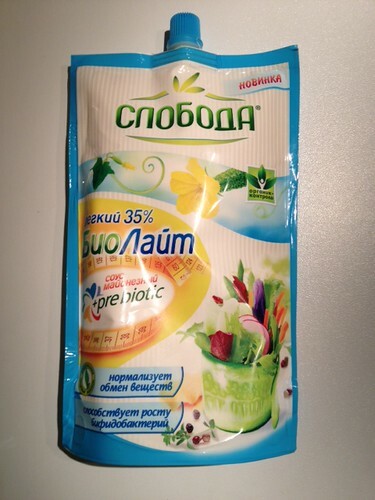 It's an adventure, that grocery store, because of course all the packaging in in cyrillic. For instance, who can tell me what this is? It took me about 15 minutes and two halting conversations with dour Russian store clerks to find this. And here... a nearby food court where I remember going with the gang. It was a very odd sensation being somewhere so manifestly foreign and yet also familiar. And I do mean background. 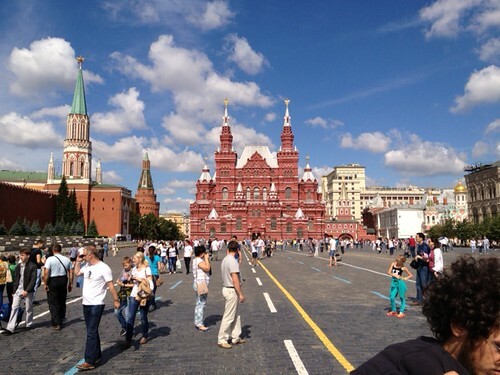 That lovely square is TWELVE lanes of crazy Moscow traffic from me and my camera.